Indian women are voting more than ever before. In many states, their turnout is now higher than that of men. But political discussions in the country rarely feature women – even in the media. What are women thinking on the eve of the 2019 election? Aarefa Johari and Nayantara Narayanan travel to find out in Half the Vote, a series that brings you the stories and perspectives of women – only women – on life and politics. Saritha MOV spends her day stitching the lower seams of jerseys. She is a tailor at one of Bengaluru’s many garment factories. 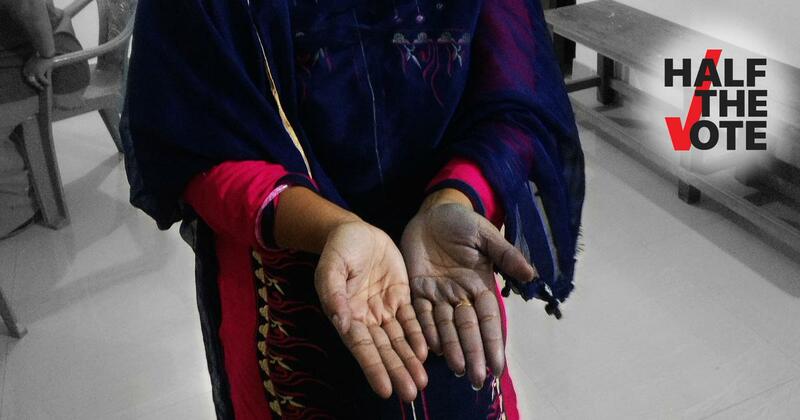 On many days she returns home with indigo stains on her left hand: as she pushes garments towards the needle, the colour of the jerseys rubs off. Although Saritha, 34, would have really have liked to be a teacher, she has spent the last 12 years working in garment factories in the city. She earns Rs 9,200 per month but wants her salary to be raised to at least Rs 18,000. That, she said, would go a long way in helping her pay her children’s school fees, her family’s medical bills and the rent. Garment workers led by labour activists and trade unions have approached the Karnataka state government several times asking for a raise in the mandated minimum wage for skilled and unskilled workers in the sector. Despite promises made by various governments led by different political parties, the wages have remained largely static. Bengaluru’s garment industry employs about 3.5 lakh workers, according to government estimates. The Garment Labour Union says this number is closer to 6 lakh and that about 90% are women. Saritha thinks that this is one reason why the government gets away with ignoring their requests. Men, by contrast, have more time and inclination to discuss issues and work on solutions, she maintained. Saritha was talking about a massive protest in April 2016 by more than a lakh workers against the union government’s decision to block workers from withdrawing from their Employment Provident Fund accounts until they turn 58. The protest forced the government to go back on its decision. When tailors fail to meet their targets, their supervisors chide or shame them. “There’s hardly any time to drink water, go to the bathroom or stretch your legs,” said Saritha. She has recently developed a pain in her right side, which a doctor has told her is a result of her sitting in one position in front of a sewing machine for long hours. One day in late March, Saritha had to rush back home after work because she had left clothes to soak before she got around to washing them. Like many working Indian women, she spends her hours at home cooking, cleaning and washing. She then waited till 11 pm to visit a local private clinic open at night for another check up for the pain in her side. Although she is entitled to subsidised healthcare under the Employees State Insurance scheme, the dispensaries that provide this service are open only during the day when she has to work. Even if she takes a day off, she may not be able to see the doctor at the dispensary that is always overcrowded. As a result, she ends up paying much more at the private clinic – Rs 1,000 for a consultation. 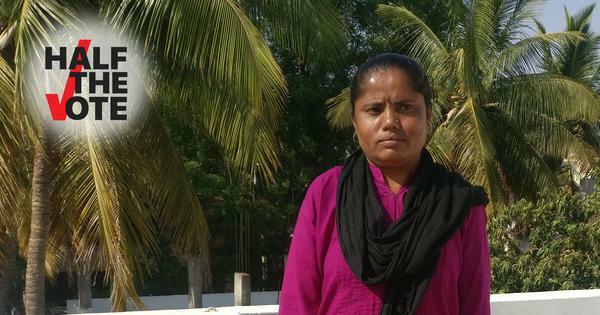 Saritha’s husband is an accountant at a cement factory and makes Rs 12,000 a month. The couple struggles to make ends meet. Barring rice rations for Rs 2 per kg under the Anna Bhagya scheme started by the previous Congress government, they get no state support. Both their families live in Mandya district, 100 km south of Bengaluru. They own agricultural land but the couple does not get a share of the produce. The families disapprove of their intercaste marriage. 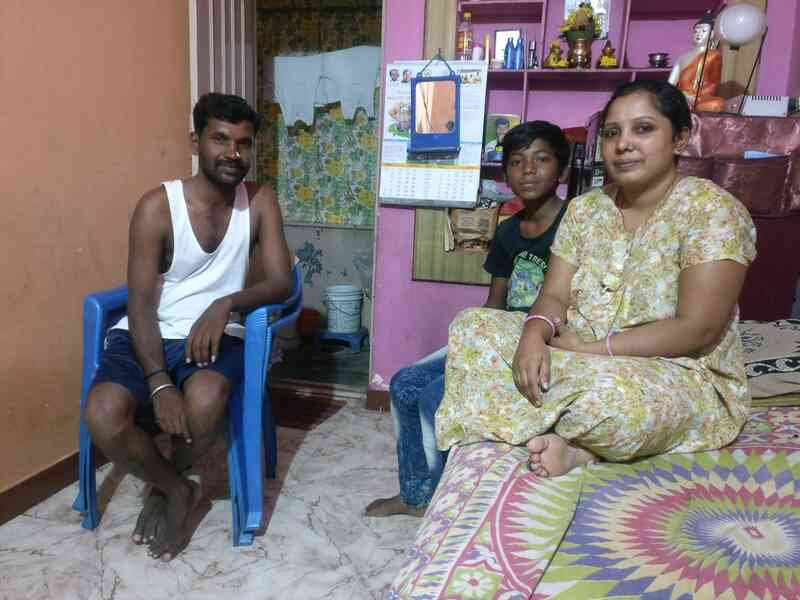 Saritha’s family is from a backward caste while her husband’s family is from a Dalit community listed as Scheduled Caste. Saritha is a registered voter in Mandya. The main electoral contest in the constituency is between Nikhil Gowda, the son of Karnataka Chief Minister HD Kumaraswamy, who is contesting on a Janata Dal (Secular) ticket, and Sumalatha Ambareesh, a former actor in Malayalam films who married Kannada actor Ambareesh. A three-time Member of Parliament from the same constituency, Ambareesh died in 2018. His wife is standing as an independent candidate but has the support of the BJP. Saritha has no preference between the two but thinks Sumalatha might win. As of now, Saritha plans to go to Mandya on April 18 to cast her vote but is not sure whether her factory management will give her the day off, even though she is entitled under state law to paid leave on election day.